Question 7. When was the Lok Sabha (the House of the People) first constituted? Question 8. When was the first Session of the Lok Sabha held? Answer. 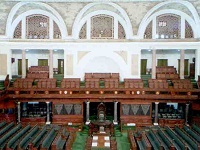 The first Session of the First Lok Sabha commenced on 13 May 1952. Question 9. 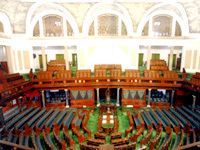 Why is the Lok Sabha called the popular chamber? Answer. The Lok Sabha is composed of representatives of the people chosen by direct election on the basis of adult suffrage. That is why it is called the popular chamber. Answer. As many as sixteen General Elections to the Lok Sabha have been held till date. The first General Elections were held from 25 October 1951 to 21 February 1952; the second from 24 February to 14 March 1957; the third from 19 to 25 February 1962; the fourth from 17 to 21 February 1967; the fifth from 1 to 10 March 1971; the sixth from 16 to 20 March 1977; the seventh from 3 to 6 January 1980; the eighth from 24 to 28 December 1984; the ninth from 22 to 26 November 1989; the tenth from 20 May to 15 June 1991; the eleventh from 27 April to 30 May 1996; the twelfth from 16 to 23 February 1998; the thirteenth from 5 September to 6 October 1999; the fourteenth from 20 April to 10 May 2004; the fifteenth from 16 April to 13 May 2009 and the sixteenth General Elections from 7 April 2014 to 12 May 2014. Question 11.Who was the first Speaker of Lok Sabha? Answer. Shri G.V. Mavalankar was the first Speaker of Lok Sabha (15 May 1952- 27 February 1956). Question 12.Who was the first Deputy Speaker of Lok Sabha? Answer. Shri M. Ananthasayanam Ayyangar was the first Deputy Speaker of Lok Sabha (30 May 1952-7 March 1956). Question 13.What is the strength of the Lok Sabha as prescribed in the Constitution? Question 14.What is the life of the Lok Sabha? Answer. Unless sooner dissolved by the President, the Lok Sabha continues for five years from the date appointed for its first meeting and no longer, as the expiration of the period of five years operates as a dissolution of the House. However, while a Proclamation of Emergency is in operation, this period may be extended by Parliament by law for a period not exceeding one year at a time and not exceeding in any case beyond a period of six months after the Proclamation has ceased to operate. Question 15. What is the quorum to constitute a sitting of the Lok Sabha? Answer. The quorum to constitute a sitting of the House is one-tenth of the total number of Members of the House under article 100(3) of the Constitution. Question 16. Which is the party having the largest number of Members in the Sixteenth Lok Sabha? Answer. The Bharatiya Janata Party having 269 Members is the largest party in the Sixteenth Lok Sabha followed by the Indian National Congress having 45 Members. Question 17. Who is the Presiding Officer of the Lok Sabha? Answer. The Speaker and the Deputy Speaker are the Presiding Officers of the Lok Sabha. Question 18. What is the term of Office of the Speaker? Answer. The Speaker continues in office till immediately before the first meeting of Lok Sabha after dissolution of the one to which he/she was elected, unless he/she ceases to be a Member by any of the reasons specified in articles 94, 101 and 102 of the Constitution. Answer. 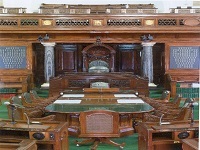 The Rules of Procedure and Conduct of Business in Lok Sabha provide that at the commencement of the House or from time to time, as the case may be, the Speaker shall nominate from amongst the Members a Panel of not more than ten Chairpersons, any one of whom may preside over the House in the absence of the Speaker and the Deputy Speaker when so requested by the Speaker or, in the absence of the Speaker, by the Deputy Speaker. A Chairperson so nominated, holds office until a new Panel of Chairpersons is nominated, unless he/she resigns earlier from the Panel or is appointed a Minister or elected as Deputy Speaker. Question 22. Who is the present Speaker of the Lok Sabha? Question 23. Who is the present Deputy Speaker of the Lok Sabha? Question 24. Who is the Leader of the House in the Sixteenth Lok Sabha? Answer. Shri Narendra Damodardas Modi. Question 25. Who is the Leader of the Opposition in the Sixteenth Lok Sabha? Answer. No Leader of the Opposition has been recognised by the Hon’ble Speaker in the 16th Lok Sabha. Question 26. Who is the Secretary-General of the Lok Sabha? Question 27. How are the Members of the Lok Sabha elected? Answer. The Members of the Lok Sabha are elected through General Elections, held on the basis of universal adult suffrage. 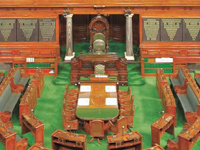 Parliament, from time to time, by law makes provision with respect to all matters relating to, or in connection with, elections to the Lok Sabha, including the preparation of electoral rolls, the delimitation of constituencies and all other matters necessary for securing the due constitution of the Lok Sabha. When the seat of a Member elected to the House becomes vacant or is declared vacant, or his/her election is declared void, the same is filled through bye-election. Question 29. Who are the nominated Members of the Sixteenth Lok Sabha? Answer. Prof. Richard Hay and Shri George Baker have been nominated by the President of India under Article 331 of the Constitution of India. Question 30. Who is the longest serving Member in the Sixteenth Lok Sabha? Answer. Shri Ram Vilas Paswan and Shri Kamal Nath are the longest serving Members in the Sixteenth Lok Sabha. Question 31. Which Member of the Lok Sabha has become the Speaker of the House in his very first term? ** Following the resignation of the then Speaker, Dr. Neelam Sanjiva Reddy to contest the Presidential elections, Dr.G.S. Dhillon was unanimously elected as the Speaker of the Lok Sabha on 8 August 1969. Question 32. What are the powers of Lok Sabha relating to Money Bills? Answer. A Bill is deemed to be a 'Money Bill' if it contains only provisions dealing with all or any of the following matters: (a) the imposition, abolition, remission, alteration or regulation of any tax; (b) the regulation of the borrowing of money or giving of any guarantee by the Government of India, or the amendment of the law with respect to any financial obligations undertaken or to be undertaken by the Government of India; (c) the custody of the Consolidated Fund or the Contingency Fund of India, the payment of moneys into or the withdrawal of moneys from any such Fund; (d) the appropriation of moneys out of the Consolidated Fund of India; (e) the declaring of any expenditure to be expenditure charged on the Consolidated Fund of India or the increasing of the amount of any such expenditure; (f) the receipt of money on account of the Consolidated Fund of India or the public account of India or the custody or issue of such money or the audit of the accounts of the Union or of a State; or (g) any matter incidental to any of the matters specified in sub-clauses (a) to (f) [Art.110]. A Money Bill can be introduced only in the Lok Sabha. The Rajya Sabha cannot make amendments in a Money Bill passed by the Lok Sabha and transmitted to it. It can, however, recommend amendments in a Money Bill. It is open to the Lok Sabha to accept or reject any or all of the recommendations of the Rajya Sabha with regard to a Money Bill. 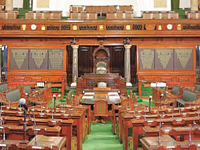 If the Lok Sabha accepts any of the recommendations of the Rajya Sabha, the Money Bill is deemed to have been passed by both Houses with amendments recommended by the Rajya Sabha and accepted by the Lok Sabha and if the Lok Sabha does not accept any of the recommendations of the Rajya Sabha, the Money Bill is deemed to have been passed by both Houses in the form in which it was passed by the Lok Sabha without any of the amendments recommended by the Rajya Sabha. If a Money Bill passed by the Lok Sabha and transmitted to the Rajya Sabha is not returned to the Lok Sabha within the period of fourteen days, it is deemed to have been passed by both Houses at the expiration of the said period in the form in which it was passed by the Lok Sabha. Question 34. Is any deadlock between the two Houses possible? Answer. Yes. In the case of Bills other than Money Bills and Constitution Amendment Bills, a disagreement between the two Houses may arise when a Bill passed by one House is rejected by the other House; or the Houses have finally disagreed as to the amendments to be made in the Bill; or more than six months have elapsed from the date of receipt of the Bill by the other House without the Bill being passed by it. Question 37. Who presides over the joint sitting of the two Houses? Question 38. Does the Speaker have the right to vote? Answer. The Speaker has a casting vote in the event of a tie. It is customary for the Presiding Officer to exercise the casting vote in such a manner as to maintain the status quo. Question 39. How many Sessions of the Lok Sabha are held in a year? Question 41. What are the methods of voting in the Lok Sabha? (ii) Division: There are three methods of holding a Division, i.e. (a) by operating the Automatic Vote Recording Equipment; (b) by distributing `Ayes' and `Noes' slips in the House; and (c) by Members going into the Lobbies. However, the method of recording of votes in the Lobbies has become obsolete ever since the installation of the Automatic Vote Recording Machine. (iii) Secret Ballot: During an 'open' voting period, the individual results are shown by the three Colours: Green for ‘Ayes’, Red for ‘Noes’ and Yellow for ‘Abstain’ on the Individual Result Display Panel. Secret voting, if any, is held on similar lines except that the Light Emitting Diode (LED) on the Individual Result Display Panel flashes only white light to show that the vote has been recorded. (iv) Recording of votes by distribution of slips: The method of recording of votes by Members on `Ayes' and `Noes' slips is generally resorted to in the eventuality of (i) sudden failure of the working of the Automatic Vote Recording Equipment; and (ii) at the commencement of the new Lok Sabha, before the seats/division numbers have been allotted to Members. (v) Physical count of Members in their places instead of a formal division: If in the opinion of the Chair, a Division is unnecessarily claimed, he/she may ask the Members who are for `Ayes' and those for `Noes', respectively, to rise in their places and on a count being taken, he/she may declare the determination of the House. In such a case, the particulars of voting of the Members are not recorded. Question 42: What is Question Hour? Answer. Rule32 of the “Rules of Procedure and Conduct of Business in Lok Sabha” provides that unless the Speaker otherwise directs, the first hour of every sitting of the House shall be available for the asking and answering of Questions. Thus, it is taken up from 1100hrs to 1200 hrs in every sitting. 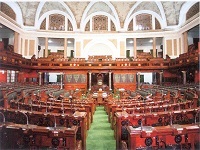 Normally, there is no Question Hour during the first Session of the new Lok Sabha and also on the day when the President addresses both houses assembled together or on the day when General Budget is presented in Lok Sabha and on the sittings held during the extended period of session or on Saturdays/Sundays and Holidays. Answer. Question is one of the important Parliamentary devices available to the Members to seek information on a matter of urgent public importance subject to conditions imposed by the Rules of Procedure and Conduct of Business in Lok Sabha and the Directions by the Speaker. A Member may ask question for the purpose of obtaining information on a subject matter of public importance within the special cognizance of the minister to whom it is addressed. Starred: A Member who desires an oral answer to his question is required to distinguish it by an asterix. Maximum 20 Questions are included in the list of Starred Questions for a particular day. This is printed on green paper. Minimum of 15 clear days notice is required for tabling Starred Questions. The Questions not orally answered in the Starred list of questions are treated as Unstarred Questions and their replies are laid on the Table of the House. Unstarred: These do not carry the asterix mark and are meant for obtaining written reply. Not more than 230 Questions can be placed on the Unstarred list for a particular sitting. This list is printed on white paper. Minimum 15 clear days notice is required for tabling Unstarred Questions. Written answers given by the Ministers are deemed to have been laid on the Table of the House at the end of Question Hour. Short Notice Question: Question can also be asked on a matter of urgent public importance at a notice of less than ten clear days. The list of admitted SNQ is printed on a pink paper. The procedure of SNQ is regulated by Rule 54 and the basic test for its admissibility is the urgency of matter. SNQ is asked and answered soon after the Question Hour. Question to Private Members: A Question may also be addressed to a Private Member under Rule 40 of the Rules of Procedure and Conduct of Business in Lok Sabha, which provides that the subject matter of the question should be related to some Bill, Resolution or other matter connected with the Business of the House for which that Member is responsible. For instance, the Questions which relates to matters under the purview of Parliamentary Committees can be addressed to respective Chairperson. Similarly, Members piloting Private Members Bills and Resolutions can be addressed questions, which are within cognizance of them under this provision. The procedure in regard to such questions is the same as that followed in the case of questions addressed to a Minister with such variations as the Speaker may consider necessary. Answer Admissibility of questions is governed by Rules of Procedure and Conduct of Business in Lok Sabha, Directions by the Speaker as also the past precedents. The Speaker, Lok Sabha, decides whether a question or a part thereof, is or is not admissible under the Rules, and may disallow any question, or a part thereof, when in his/her opinion, it is an abuse of the right of questioning or is calculated to obstruct or prejudicially affect the procedure of the House or is in contravention of the Rules. The right to ask a question is governed by certain conditions like it should be pointed, specific and confined to one issue only. It should not contain arguments, inferences, ironical expressions, imputations, epithets or defamatory statements. Question 48. What is an Half-an-Hour Discussion? Answer. Another instrument available to the Members of Lok Sabha for raising issue of public importance is the Half-an-Hour Discussion. Under this, a Member may raise discussion on a matter of sufficient public importance which has been the subject of a recent question, Starred, Unstarred or Short Notice Question and the answer to which needs further elucidation on a matter of fact. Question 51. What is a Bill? Answer. A Bill is the draft of a legislative proposal brought before the House for its approval. Question 52. What are the different types of Bills? Answer. Bills initiated by Ministers are called Government Bills and those introduced by Members who are not Ministers are known as Private Members' Bills. Depending on their contents, Bills may further be classified broadly into (a) Original Bills (Bills embodying new proposals, ideas or policies); (b) Amending Bills (Bills which seek to modify, amend or revise the existing Acts); (c) Consolidating Bills (Bills which seek to consolidate existing laws on a particular subject; (d) Expiring Laws (Continuance) Bills (Bills to continue an expiring Act); (e) Repealing Bills (Bills seeking to repeal existing Acts); (f) Bills to replace Ordinances; (g) Constitution (Amendment) Bills; and (h) Money and Financial Bills. Question 53. Who decides whether a Bill is an ordinary Bill or a Money Bill? Answer. In case any question arises whether a Bill is a Money Bill or not, the decision of the Speaker, Lok Sabha, thereon, is final. When a Bill is held to be a Money Bill, the Speaker endorses a certificate thereon duly signed by the Speaker to that effect that it is a Money Bill before the Bill is sent to the Rajya Sabha or presented to the President for assent. Question 54. What is the difference between a Bill and an Act? Answer A Bill is a draft legislative proposal before the House. It becomes an Act only when passed by both the Houses of Parliament and assented to by the President. Question 55. What are the various steps involved in the passage of a Bill? Question 56. What is Budget? Answer. Budget is the `Annual Financial Statement' or the Statement of the Estimated Receipts and Expenditure of the Government of India in respect of each financial year, presented to the Lok Sabha on such day as the President may direct. A copy of the Budget is laid in the Rajya Sabha soon after its presentation in the Lok Sabha. The preparation and presentation of the Budget for the approval of the Legislature is a constitutional obligation on the part of the Government, both at the Centre and in the States. Question 57. When is the Budget Session of Parliament held? Answer. The Budget Session of Parliament is normally held during February to May of the year. During this period, the Budget comes before the Parliament for its deliberation, voting and approval; the Departmentally related Standing Committees consider the Demands for Grants of Ministries/Departments and report on the same to the Houses of Parliament. Question 58. Who presents the Budget in the House? Answer. Two types of Budgets are usually presented in the House namely, the General Budget and the Railway Budget. The General Budget is presented by the Minister of Finance and the Railway Budget by the Minister of Railways. Question 59. What is a Calling Attention ? Answer. Under this procedural device, a Member may, with the prior permission of the Speaker, call the attention of a Minister to any matter of urgent public importance and the Minister may make a brief statement thereon. There shall be no debate on such a statement at the time it is made. After the statement, brief clarifications can be sought from the Minister by the Member who has initiated the Calling Attention and other Members whose names appear in the List of Business are called by the Speaker. Only those matters which are primarily the concern of the Union Government can be raised through a Calling Attention notice. The Calling Attention procedure is an Indian innovation which combines asking a question with supplementaries and making brief comments; the Government also gets adequate opportunity to state its case. The Calling Attention matter is not subject to the vote of the House. Question 60. What is a Motion? Answer. The term `motion' in parliamentary parlance means any formal proposal made to the House by a Member for the purpose of eliciting a decision of the House. It is phrased in such a way that, if adopted, it will purport to express the judgement or will of the House. Any matter of importance can be the subject matter of a motion. The mover of a motion frames it in a form in which he/she wishes it ultimately to be passed by the House and on which a vote of the House can conveniently be taken. Question 61. What are the different types of Motions? Subsidiary motions depend upon or relate to other motions or follow up on some proceedings in the House. By itself, a subsidiary motion has no meaning and is not capable of stating the decision of the House without reference to the original motion or the proceedings of the House. Question 62. What is an Adjournment Motion? Answer. Adjournment Motion is the procedure for adjournment of the business of the House for the purpose of discussing a definite matter of urgent public importance, which can be moved with the consent of the Speaker. The Adjournment Motion, if admitted, leads to setting aside of the normal business of the House for discussing the matter mentioned in the motion. To be in order, an adjournment motion must raise a matter of sufficient public importance to warrant interruption of normal business of the House and the question of public importance is decided on merit in each individual case. The purpose of an Adjournment Motion is to take the Government to task for a recent act of omission or commission having serious consequences. Its adoption is regarded as a sort of censure of the Government. Question 63. What is a Motion of No-confidence? Question 64. What is a No-Day-Yet-Named Motion? Question 65. What is meant by a Discussion under Rule 193? Question 66. What is a Short Duration Discussion? Question 67. What is meant by matters under Rule 377? Matters, which are not points of order can be raised by way of Special Mentions under Rule 377. This procedural device, framed in 1954, provides opportunity to the Members to raise matters of general public interest. At present, the number of matters that can be raised by Members under rule 377 on a single day is 20. Question 68. What is ‘Zero Hour’ ? Answer. The time immediately following the Question Hour and laying of papers and before any listed business is taken up in the House has come to be popularly known as the `Zero Hour'. As it starts around 12 noon, this period is euphemistically termed as `Zero Hour'. For raising matters during the ‘Zero Hour’ in Lok Sabha, Members give notice between 8.30 a.m. and 9.00 a.m. everyday to the Speaker stating clearly the subject which they consider to be important and wish to raise in the House. It is, of course, for the Speaker to allow or not to allow for raising such matters in the House. The term `Zero Hour' is not formally recognised in our parliamentary procedure. Question 69. How many matters are allowed to be raised under ‘Zero Hour’ ? Answer. At present, twenty matters per day as per their priority in the ballot are allowed to be raised during "Zero Hour". The order in which the matters will be raised is decided by the Speaker at his/her discretion. In the first phase, 5 matters of urgent national and international importance, as decided by the Chair, are taken up after Question Hour and laying of papers, etc. In the second phase, the remaining admitted matters of urgent public importance are taken up after 6.00 P.M. or at the end of the regular business of the House. However, since there is no provision in the rules regarding ‘Zero Hour’, hence there is no maximum limit on the number of matters that can be raised on any given day. Question 70. What is a Resolution? Â· Resolutions which are expression of opinion by the House: Since the purpose of such a Resolution is merely to obtain an expression of opinion of the House, the Government is not bound to give effect to the opinions expressed in these Resolutions. Â· Resolutions which have statutory effect: The notice of a Statutory Resolution is given in pursuance of a provision in the Constitution or an Act of Parliament. Such a Resolution, if adopted, is binding on the Government and has the force of law. Â· Resolutions which the House passes in the matter of control over its own proceedings: It has the force of law and its validity cannot be challenged in any court of law. The House, by such a Resolution, evolves, sometimes, its own procedure to meet a situation not specifically provided for in the Rules. Question 71. What is a Point of Order? 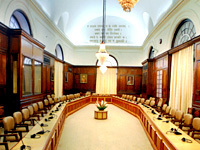 A Point of Order may be raised only in relation to the business before the House at the moment, provided that the Speaker may permit a Member to raise a Point of Order during the interval between the termination of one item of business and the commencement of another if it relates to maintenance of order in, or arrangement of business before, the House. A Member may formulate a Point of Order and the Speaker shall decide whether the point raised is a Point of Order and if so give the decision thereon, which is final. Question 72. Does the Speaker have the power to adjourn the House or suspend the sitting? Answer: Under Rule 375, in the case of a grave disorder arising in the House, the Speaker may, if thinks it necessary to do so, adjourn the House or suspend any sitting for a time to be named by the Speaker. Question 73. When does the President address the Parliament? Answer. The Constitution provides for an Address by the President to either House or both Houses assembled together [Article 86(1)]. The Constitution also makes incumbent upon the President to address both Houses of Parliament assembled together at the commencement of the first Session after each General Election to the Lok Sabha and at the commencement of the first Session each year and inform Parliament of the causes of its summons. [Article 87(1)]. The matters referred to in the Address by the President to the Houses are discussed on a Motion of Thanks moved by a Member and seconded by another Member. Question 74. Can Members raise questions on the Address by the President? Answer. No Member can raise questions on the Address by the President. Any action on the part of a Member which mars the occasion or creates disturbance is punishable by the House to which that Member belongs. Discussion on matters referred to in the Address takes place on a Motion of Thanks moved by a Member and seconded by another Member. The scope of discussion on the Address is very wide and the functioning of the entire administration is open for discussion; the limitations inter alia are that Members should not refer to matters which are not the direct responsibility of the Government of India, and the name of the President should not be brought in during the debate since the Government, and not the President, is responsible for the contents of the Address. Question 75. What are parliamentary privileges? Answer The term `parliamentary privilege' refers to certain rights and immunities enjoyed by each House of Parliament and Committees of each House collectively, and by Members of each House individually, without which they cannot discharge their functions efficiently and effectively. The object of parliamentary privileges is to safeguard the freedom, the authority and the dignity of Parliament. The powers, privileges and immunities of either House of Parliament and of its Committees and Members have mainly been laid down in article 105 of the Constitution. The House has the power to punish any person who commits a contempt of the House or a breach of any of its privileges. Question 76. Are the parliamentary privileges codified in India? Question 77. What is the difference between breach of privilege and contempt of the House? Contempt of the House may be defined generally as any act or omission which obstructs or impedes either House of Parliament in the performance of its functions, or which obstructs or impedes any Member or officers of such House in the discharge of his or her duty, or which has a tendency, directly or indirectly, to produce such results even though there is no precedent of the offence. Whereas all breaches of privilege are contempts of the House, a person may be guilty of a contempt of the House even though he does not violate any of the privilege of the House, e.g. when he disobeys an order to attend a Committee or publishes reflections on the character or conduct of a Member in his capacity as a Member. Question 78. What is the procedure for addressing a question of privilege? Answer. A question of privilege may either be considered and decided by the House itself or it may be referred by the House or by the Speaker to the Committee of Privileges for examination, investigation and report. Question 79. What is the rule relating to 'Automatic Suspension' of a Member? Question 80. What is the MPLAD Scheme? Answer. Members of Parliament Local Area Development Scheme (MPLADS) was introduced in December, 1993. Under this Scheme, a Member of Lok Sabha has the choice to recommend to the Head of the District, development works with emphasis on the creation of durable community assets based on the locally felt needs to the tune of Rupees five crore per year, to be taken up in his/her Constituency. Detailed information about the Scheme is available in the MPLAD Scheme website "www.mplads.nic.in". Question 81. What is the current salary of a Member? Answer. At present, a Member of Parliament is entitled to Rs. 50,000/- per month as salary, Rs. 45,000/- per month as Constituency Allowance, Rs.45,000/- per month as Office Expense Allowance out of which Rs. 15,000/- is for meeting expenses of stationery items and postage; and up to Rs. 30,000/- is paid by the Lok Sabha Secretariat to the person(s) as may be engaged by a member for obtaining secretarial assistance. A Member also gets daily allowance of Rs. 2,000 for the period of residence on duty. Daily allowance will be paid only when he/she signs the register maintained for the purpose. Question 82. Are Members of Parliament entitled to any pension? Answer. Every person who has served as a Member of the Provisional Parliament or either House of Parliament for any period is entitled to a pension of Rs.20,000/- per month w.e.f. 18 May 2009. Where any person has served for a period exceeding five years, he/she shall be paid an additional pension of Rs.1500/- per month for every year in excess of five years. For the purpose of calculation of years for determination of additional pension, the period of nine months or more is treated as one complete year. Question 83. Where do I get more information on Members of Lok Sabha? Question 84. How can I get in touch with a Member of Lok Sabha? Answer. Members can be contacted through E-mail. Permanent and Local addresses of Members of Lok Sabha are also available at the Lok Sabha Web Site (http://loksabha.nic.in). Question 85. Where do I get information on the Sessions of Lok Sabha? Question 86. Who maintains the Lok Sabha website and how do I send a feedback? This Site is designed and hosted by National Informatics Centre. Contents are provided and updated by Lok Sabha Secretariat.